1.During the visit of the Defender to Elvin Arif Oglu Ibrahimov, the defense advocate and the investigator were present and at that moment were conducting investigative actions envisaged in the Criminal Procedure Code. With them, the HRD discussed issues regarding Elvin Arif Oglu Ibrahimov’s rights. 2.A licensed interpreter of the Azerbaijani language is involved in the criminal proceedings. 3.The advocate is involved in Ibrahimov’s case from the Public Defender’s office of the Chamber of Advocates. During the Defender’s visit, the advocate had already had a meeting with E. Ibrahimov and explained to him his rights and facts related to the criminal case. 4.The Armenian Ombudsman had a private interview with Elvin Ibrahimov, which was conducted with the participation of the interpreter. 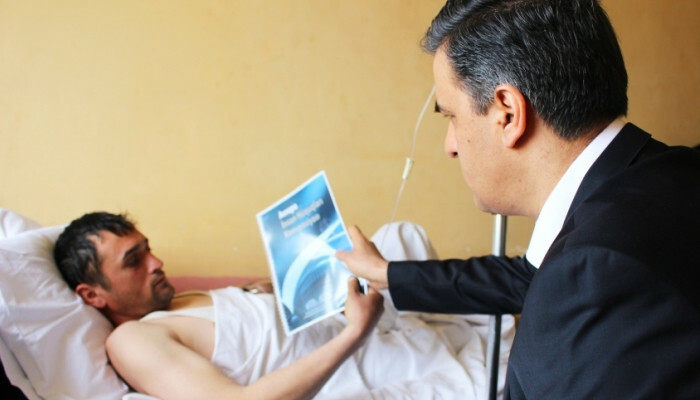 The Human Rights Defender, inter alia, presented to Elvin Arif oglu Ibrahimov his rights to: receive information in a language understandable to him; communicate with the help of an interpreter; receive legal assistance; access to the outside world, including contacts with family. The Ombudsman explained to Mr. Ibrahimov that, if necessary, he can call directly to the HRD hotline via the 116 number, which is active 24 hours with no non-working days. 5.During the private interview with the Defender, E. Ibrahimov expressed his willingness to meet with or to talk to his family members, namely his son, father, mother, brother and sister, and requested the Defender’s assistance for that matter. Given the importance of achieving contact with his family, Mr. Arman Tatoyan discussed this issue with the Director of the National Security Service of Armenia. The Service expressed its readiness to organize any communication between Elvin Arif Oglu Ibrahimov and his family, including through letters, messages (paper communication), telephone or video communication. Moreover, the Service expressed its readiness to organize Mr. Elvin Arif Oglu Ibrahimov’s meeting with his family members in the territory of the Republic of Armenia and to guarantee their security in the country. As an independent official, the Human Rights Defender of Armenia is ready to assist in facilitating contacts between E. Ibrahimov and his family, including in the organization of the meeting between them. 6.The medical doctor of the Human Rights Defender’s Office also participated in the visit. Mr. Ibrahimov’s health condition and his medical documentation were examined. It was recorded that his health condition was satisfactory; he was admitted to the hospital with a gunshot missile injury to lower third of right shin. In the hospital, primary surgical treatment of wounds on the lower limb and extracorporeal osteosynthesis were performed. The visit also recorded that Mr. Ibrahimov is receiving necessary medical treatment and that an X-ray examination was prescribed to ensure the effectiveness of his treatment. 7. At the end of the private interview, the Defender provided Elvin Arif Oglu Ibrahimov with the text of the European Convention on Human Rights and Fundamental Freedoms in Azerbaijani, English and Russian languages, as well as the English and Russian versions of the Constitution of Armenia. 8.After the visit, the Ombudsman had a conversation with the Head of Delegation of the International Committee of the Red Cross (ICRC) in Armenia. He has provided information on Elvin Ibrahimov’s health and expressed his readiness to provide assistance in order to ensure Elvin Ibrahimov’s contact with his family. Elvin Ibrahimov crossed the Armenian border near Barekamavan village in the Tavush region on March 16, 2019, at 01: 00-01: 30. According to the documents he carried, he is a citizen of Azerbaijan. A criminal case has been initiated on the fact of illegally crossing the state border of the Republic of Armenia by Elvin Ibrahimov in accordance with Article 329 (1) of the RA Criminal Code.